Your #5 Sciatica Stretch is called the Sphinx, or Lower Abdomen Stretch. This stretch is going to help stretch your abdominals while also assisting in pushing a bulging disc back into place. This is a manual way to try and decrease your sciatica symptoms that are being caused by a disc bulging onto a nerve. Start position: Find a nice firm flat surface and lay down on your stomach. In the footage above Dr. Amy is using a mat table but if you don’t have one of these you can either use your floor or your bed as your flat surface. Start by lying face down on a mat. Keep your legs slightly apart. Place your hands on the floor slightly wider than shoulder width apart. Use your upper body to prop up onto your elbows. Hold this for 10 seconds and then relax the elbows down and repeat 4 times. If this is easy for you try going all the way up to your hands for an even greater stretch. 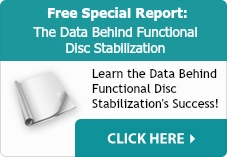 Please click the link for additional information on Functional Disc Rehydration. Our non-invasive treatment method has helped many people overcome Sciatica and other back pain issues!